Andrea is passionate about designing experiences that put people on a path to fulfill their potential, both personally and as agents of positive change in the world. 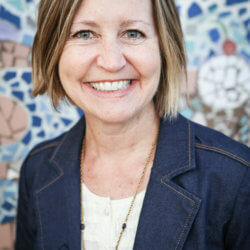 With twenty years of experience as an educator, Andrea has worked as a school administrator, district curriculum specialist, and as the director of No Barriers Youth. Prior to these roles, she taught in international schools in Venezuela, Chile, and Ecuador, as well as in New York City public schools. Andrea earned her Master’s in Education from Teachers College Columbia University. Outside of work, Andrea thrives on new challenges, and loves exploring the wilderness and the world alongside her husband and son.